Become SPIN Certified Project Planning Engineer! Do you have all it takes to be a professional project planning engineer? SPIN enables you to measure yourself against our Project Planners Career-path Model. By becoming a member of SPIN you get free access to our Planning Certification Program. Start building your professional resume and immediately see which level you can apply to. As soon as you have reached one of our levels SPIN will, at your demand, verify the information provided and issue a independent 'Certificate of Recognition (COR)'. From that moment on you are also added to our register of professional project planning engineers which will help you in your future development and career! For the professionalization in the field Project Planning the Dutch Planning & Scheduling Association (SPIN) introduces a completely new functionmodel. The field of planning is in full swing. The establishment of Project Management Organizations (PMO) and the use of modern planning-/project-management systems requires a redefinition of the function of the project planner. Within organizations, a project planner's assets are at, but not limited to, project level. He / she has to deal with the portfolio of projects and issues within management and various other departments. Time has come for the New Project Planner. At the end of 2011 a function model was composed for three function levels and five function phases. The following function levels have been identified. Based on this Project Planner role model, per function level / phase a set of training- and experience guidelines has been drawn. 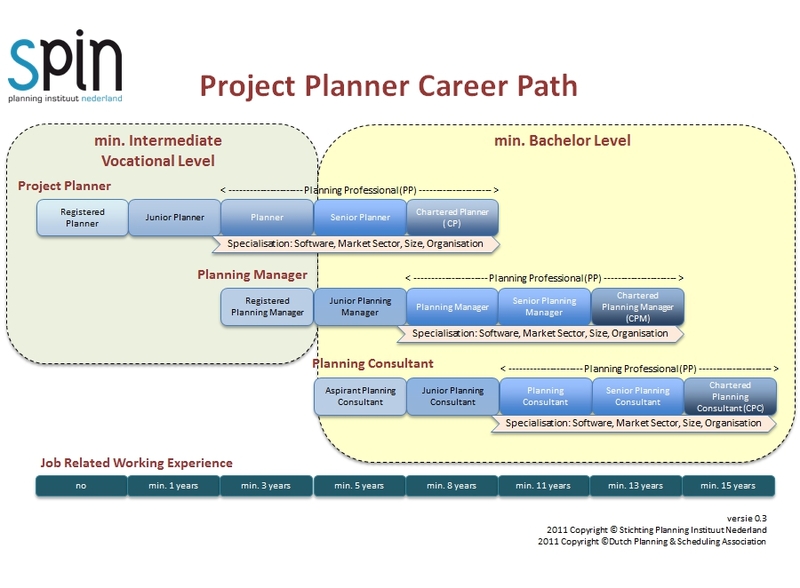 Check the Project Planner Career Path for more info.